A whirlwind tour of around 1500 miles, over 14 days taking in five national parks, across five states provided the opportunity to visit a number of iconic landscapes. We worked hard to ensure the trip went as smoothly as possible and appreciated the role finding suitable accommodation in each place at the appropriate time played in achieving this, particularly given that we had left it pretty late to finalise arrangements. American Sky proved to be up to the challenge, always helpful no matter how many times we altered routes, dates and preferences. They even managed to secure rooms in accommodation that generally sell out a year or more in advance. Our route took us from the desert heat of Las Vegas to the cold of the mountains in Yellowstone National Park. After two nights in Vegas first up was a stay in Springdale and the opportunity to explore Zion National Park. A day on the canyon floor taking in the sights was followed by a late afternoon jeep tour of the high ground to get a very different perspective. Dusty, bumpy dirt tracks led to some truly outstanding views. Even the heavy rain showers failed to dampen our spirits in the open top jeep. Looking towards the mountains bordering the canyon, the dramatic lighting and the setting sun provided photographic opportunities aplenty. 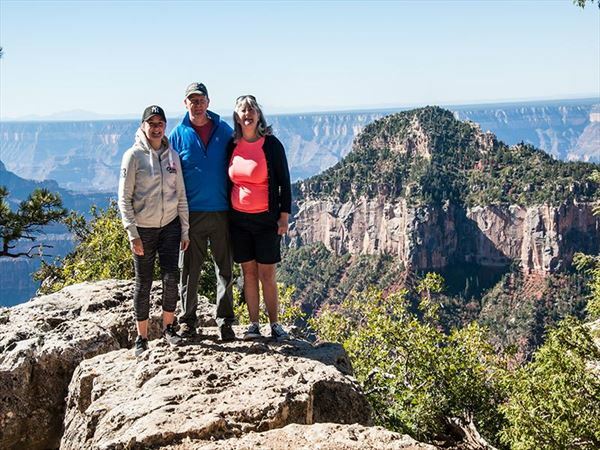 The north rim of the Grand Canyon was reached from Springdale in 2-3 hours. 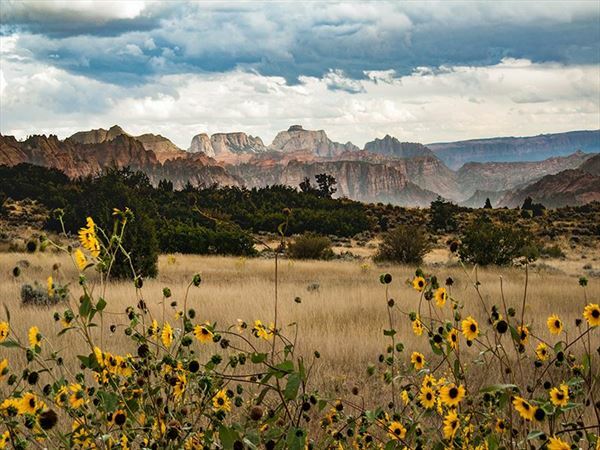 The only lodge on this rim provided an ideal base to experience this less visited side of the canyon and it offers quite different views from the south rim but no less dramatic. It proved easy to find a trail with almost nobody on it, which was very tranquil. 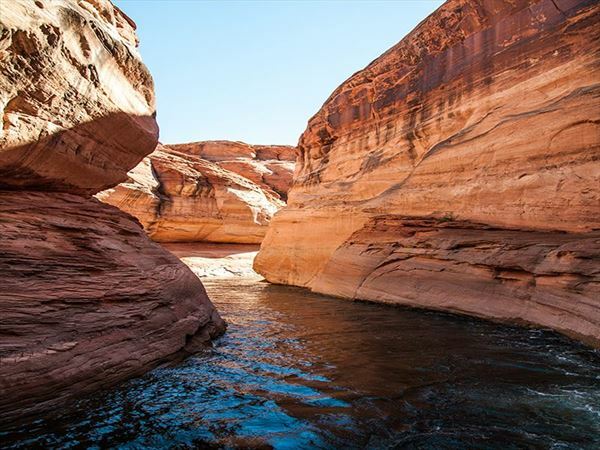 A similar length drive, with stops at the Navajo bridges and Horseshoe bend, took us to the shores of Lake Powell, created in 1963 by the damming of the Colorado river and the flooding of Glen Canyon. Although its primary role is a reservoir, it is a haven for water sport enthusiasts and its extensive coastline of 1900 miles is home to many houseboats. A highlight was entering Antelope Canyon by boat and the skipper was able to navigate inwards until the water became shallow beneath the narrow gap between the cliffs. Travelling to Bryce Canyon was again around a three hour drive. 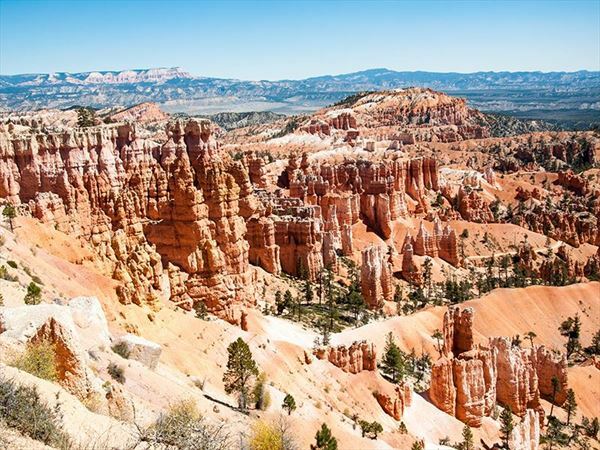 The canyon is impressive from the rim but spectacular from the canyon floor amid the striking hoodoos, columns of twisted gnarled rocks shaped over time by the forces of nature. An outing on horseback provided an alternative way of viewing the canyon floor and allowed us to see much more in the limited time we had in the area. Being complete novices, it was unsettling at first with the horses walking so perilously close to the cliff edge, but a wonderful experience all the same. 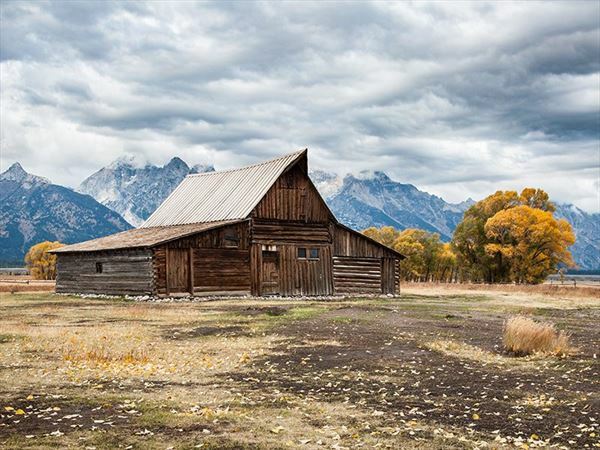 An overnight stop in Salt Lake City split the longer journey north to Jackson and Grand Teton National Park. Dinner at Dornans close to Moose Junction, during an open mic session for local musicians, with the sun setting behind the majestic Grand Teton mountains, brought an end to two days of travelling – except for the large male moose crossing the road on the way home. An early rise followed the next morning for a wildlife drive and it was then time to make the relatively short journey north through the vibrant fall colours of the willow and aspen trees to Yellowstone National Park. Lake Yellowstone hotel and cabins provided the ideal location to explore the geothermal sites and look for wildlife in Yellowstone. Another early wildlife drive provided the opportunity to see both grizzly and black bear along with wolf, elk, coyotes, mule deer, big horn sheep and mountain goats. Our final evening in Yellowstone was spent in a 1930s touring car, driven by Rod, who is also Yellowstone’s resident guiding photographer. Our trip to the top of Lake Butte to see the sun set turned out to be a private tour, an unexpected bonus as we were the only booking that evening, so we made the most of Rod’s undivided attention and benefited from his photography tips. Although the sun failed to show through thickening cloud we were not disappointed and were instead treated to an incoming storm the lightening from which lit up the lake providing an opportunity for some last photos before a hasty retreat back to our cabin before the rains. The following morning brought our departure back to Jackson, via stops at the Snake River overlook to replicate, as best possible, Ansel Adams iconic image and also pictures of historical Mormon Row. The long journey home provided plenty of time for reflection and we agreed that despite best intentions there is always scope for something to go wrong on trips like this but luckily, and unusually for us, all went well, which can, in part be to the credit of American Sky. We would like to thank David, Sharyn & Ruth for sharing their story with us and hope to welcome you on another holiday soon..